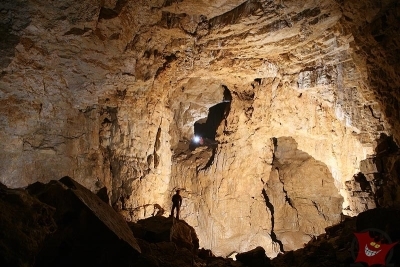 The Arge Grabenstetten has a tradition of more than 20 years regarding the search for the Blauhöhle. In 1988 the digging for an entry began in the Sontheimer Schacht 1 (“Shaft 1 of Sontheim”). Several actions were also undertaken in the Auenschacht near the village of Zainingen, as well as in the Steebschacht near Blaubeuren-Wennenden in 1991. The first successful dig was the one in the Vetterhöhle performed by the Arge Grabenstetten since 2002 and in which great successes were reached since 2006. Since its foundation the Arge Grabenstetten has been supporting the activities of the Arge Blaukarst, a cross-association research project, performing research in the Hessenhauhöhle near Berghülen and the Seligengrundhöhle near Blaubeuren-Seißen. What is so special about the Blauhöhle? Ever since the terrific discovery by Jochen Hasenmayer in the Blautopf more often the subject of conversation between Swabian cave explorers revolves around this cave system. Two issues were in the center of attention: The age of the karstification and the usage of potential geothermal energy. At the beginning, only a few dealt with another aspect more intensely, namely the cave behind the Blautopf which reaches far into the Albhhochfläche (a certain area within the Alp). Most probably we are dealing here with the largest cave system of the Swabian Mountains, if not even of Germany. Jochen Hasenmayer says:“…About 2.5 km away from the Blautopf the ceiling of the cave should rise above groundwater level, then, in about 4 km the rocky ground of the cave which would then be traversed by a shallow river.” (HASENMAYER, GEO 5/1986, S. 10-38). This is also what E. Villinger thinks when he writes:“…it is well possible that the cave finally rises above the water about 1.5 kms past the Mörikedom. Behind that the cave could be run through by a stream.” (VILLINGER, Geol. Jahrbuch, Reihe C49, 1987, S. 71-103). The interior dimensions of the Blauhöhle are certainly immense for the most part, bigger than all known caves of the Swabian Mountains. In the meantime there has been much progress, of course. 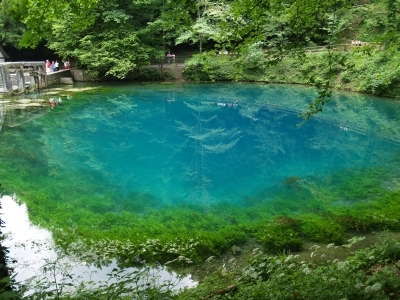 Due to the bore of the city of Blaubeuren in early summer of 2010 along the B28 the divers of the Arge Blautopf had the chance to explore staying dry rather than performing dangerous and complex dives. The Arge Blaukarst managed to make it 100 meters deep and got very close to the water level of the karst. The Höhlenverein Blaubeuren was able to reach depths of 45 meters in the Steebschacht.